New Site For Gay Dads To Launch - Joe.My.God. A new website to help gay dads navigate fatherhood will launch tomorrow, June 4th – in time for Father’s Day and this year’s Pride celebrations. 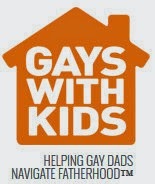 GayswithKids.com hopes to inspire a whole new generation of gay men who are interested in raising children by offering in-depth reporting on topics from creating families to raising them. It will also focus on challenges that are unique to gay dads. It is being founded by Brian Rosenberg and Ferd van Gameren, two gay fathers who realized the need for GayswithKids.com when they had children and discovered nearly every parenting news source was mom-centric. They found no community with whom they could identify – so they built one. Previous Nancy Grace: Why Would Somebody Hit “Sweet Lady” Anita Bryant With A Pie?